Last February 26, I was one of Mommy Bloggers Philippines group members given the privilege to meet 2012 Mrs. Philippines Globe and Mrs. Globe Finals Face of the Year Joyce Agsaway, 2013 Mrs. Philippines Globe Ruby Jane Lehmann and its National Pageant Director, Morena Carla Cabrera-Quimpo. Also present were Solane Mother of the Year winner, Jessie Lou Lucero and Steph Magali Malibiran, who won Mrs. Asia Tourism International 2013 in Malaysia. 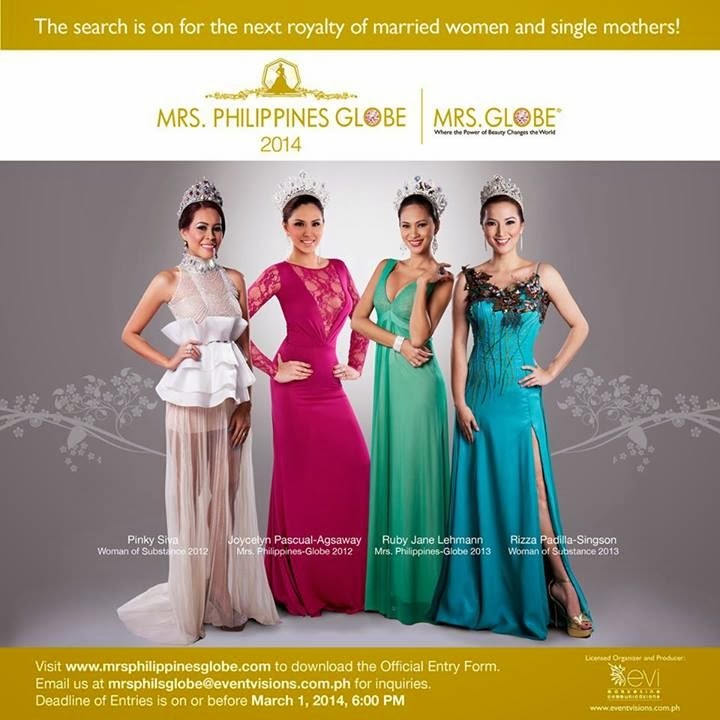 The Mrs. Philippines-Globe search is a means for married women or single mothers to fulfill their dreams of becoming a beauty queen. Filipinas who fit in the rare combination of beauty and substance will have equal opportunity to fulfill dreams and destiny to do great things as they compete in one of the biggest international pageants for married women usually participated in by 40 countries. Mrs. Philippines-Globe national pageant director Morena Carla Cabrera-Quimpo herself was a beauty queen. She was hand-picked to represent the Philippines for Mrs. Globe 2011. After her wonderful experience competing in the US finals, she acquired Mrs. Globe license to run the pageant locally through her company EVI Marketing Communications. At the Meet and Greet, Agsaway and Malibiran joined our table to share more about their journey and relay how the Mrs. Philippines-Globe competition changed their lives. Their outstanding feats truly exemplifies what a woman of substance is all about. Grand winner of Mrs. Philippines-Globe first-ever search in 2012, Joycelyn Agsaway, juggles motherhood and work as manager of Edsa Shangri-La’s Horizon Club. Aside from being a family-oriented woman hotelier, she also finds time for her advocacy, working as a volunteer teacher at University of the Philippines’ Ugnayan ng Pahinungod. Tallest among the first Mrs. Philippines-Globe batch at 5'10", Agsaway bested 14 other finalists and took home P700,000 worth of prizes. She represented the Philippines to the Mrs. Globe World Finals last August 11-19, 2012 in Rancho Mirage, California, USA and won Mrs. Globe Finals Face of the Year. Stephanie Malibiran, a wife to a medical practitioner, and a mother of one, was voted as the Most Beautiful Face during the Mrs. Philippines-Globe 2013 candidates’ press presentation. Though a runner up at Mrs. Philippines-Globe 2012, it didn't deter her to strive and compete in Malaysia the following year. It won her the international title Mrs. Asia International Tourism 2013. Women usually have their hands full---juggling husbands, children, managing households, serving communities and jobs. Speaking to these two women whose married status didn’t get in the way of fulfilling their dreams made me realize that women should always keep the big picture in mind and always focus on constructive ways to get even better. 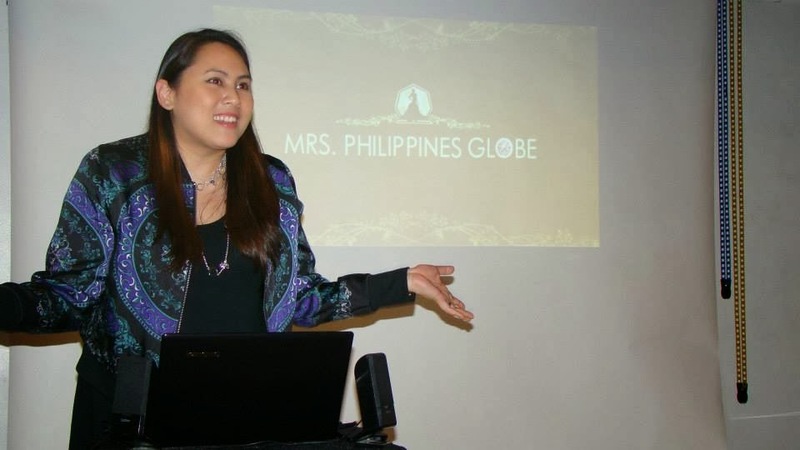 Mrs. Philippines-Globe is the local franchise of Mrs. Globe USA, which aims to help women and children recover their self-esteem through empowerment and in ensuring basic rights and human dignity. Mrs. Philippines-Globe is a preliminary to Mrs. Globe competitions. Competing for the title is once in a lifetime experience. Mrs. Philippines-Globe is directed at inspiring Filipinas on how they can use their beauty and talent to contribute to society. Do join in because you deserve it. Mrs. Globe in the US is a fund-raising project of the Women In Need Foundation that advocates women empowerment. Women In Need (WIN) Foundation on the other hand, is founded by a group of women activists with the aim to achieve total liberation and comprehensive empowerment of women and children in the most vulnerable sections of the local community. The said foundation is committed to developing the potential of those who are socially and economically marginalized. It provides services and support aimed at long-term sustainable development of women and children in the downtrodden community. Mrs. Philippines Globe 2014 pageant screenings will be held on March 15 for Cebu/Davao Screening at Teatro Casino, PAGCOR Cebu, Waterfront Hotel, Lahug, Cebu City. For those coming from GMA/Luzon areas, screening will be held on March 22 at Citrus Snap Studio, 8th Floor, RCI Building, Rada Street, Makati City. Twenty (20) candidates will be shortlisted to compete for Mrs. Philippines Globe 2014 crown on May 17 national pageant night at SMX Aura Premiere in Bonifacio Global City. The crowned Mrs. Philippines Globe 2014 will then represent the country at the Mrs. Globe 2015 World Finals in Shenzhen, China come November 2014.